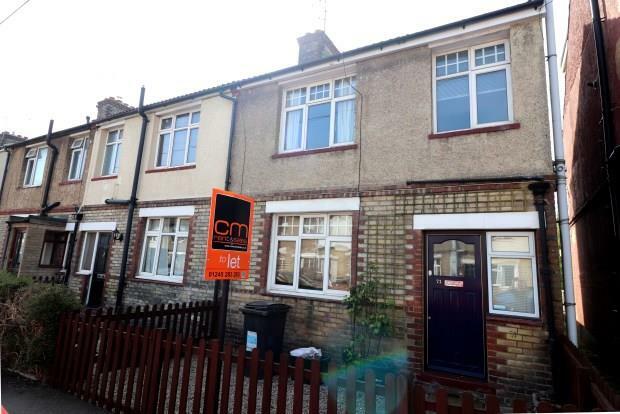 3 Bedroom End of Terrace House To Rent in Chelmsford for £1,100 per Calendar Month. Situated on this residential street just 5 minutes walk to the University, Train Station & City Centre. The property is also just moments from Fitness 364 Health Club & New Street Brassiere. Well presented and spacious home in central location suited to a Family needing travel links to the Capital. Front Door into Carpeted Hallway, Stairs rising to 1st floor, doors to Lounge & Kitchen/Diner. Carpeted, Feature Fireplace, TV Socket, Window to front with Curtains. Wooden Flooring, Sink/Drainer, electric Cooker, Fridge/Freezer, Washing Machine & Dishwasher, Windows to rear with Curtains, open into Dining Area & Conservatory. Wooden Flooring, TV Socket, Patio doors to side leading to Garden. Carpeted, Loft access, doors to Bedrooms and Bathroom. Carpeted, feature Fireplace, Windows to front with Curtains. Carpeted, Feature fireplace, Window to rear. FURNITURE TO REMAIN: double Wardrobe. Carpeted, Window to rear with Curtains. Tiled Floor, white suite comprising of push button WC, Basin, roll-top Bath & separate Shower Cubicle, Mirrored Cabinet, Extractor Fan, obscured Window to front with Vertical Blinds. Enclosed and SOUTH-FACING the Garden with mainly laid to Lawn with Paved Patio, Shingled Area, wooden Summer House/Shed (Lawn Mower to remain) and Gate providing access to the front of the property. On-street residents permit parking (approx Â£26/car/year at Jan 2015 - subject to availability and application with Chelmsford City Council). No Students, Sharers Or Pets!